If you are looking for decorations, I love these little pine cone trees that my friend, Dariela, shared on her blog, Mami Talks. They are so simple to make, and yet they look lovely with the little splash of color from the small pom-poms. Mummy's Busy World teaches you how to make sparkly, festive pine cones with just a little bit of paint and glitter. These could be used as decoration, or given as gifts. Last year, The Magnifying Glass shared easy directions for making cinnamon-scented pine cones. We love this idea and are making some to give as aromatic fire starters. We've even gone a step further to create peppermint potpourri using the same directions, just a different essential oil and a variety of cones of different shapes and sizes. Also on the gift-giving front, I think these pine cone picture frames are genius! Naturally, they are from Martha Stewart (how does she make things look so classy and why can't I think of them first?!) 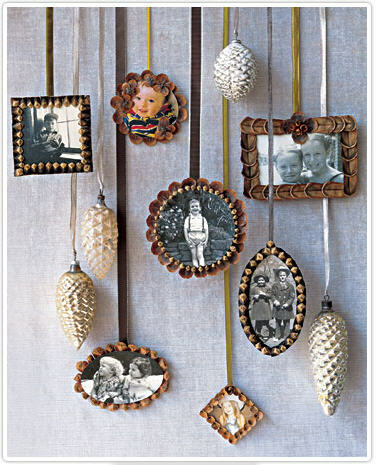 Her site doesn't mention the hanging pine cone ornaments in this picture, but I think they would be terribly easy to make using real pine cones. A little white or silver spray paint and some velvet ribbon, no? Have you visited The Magic Onions blog? 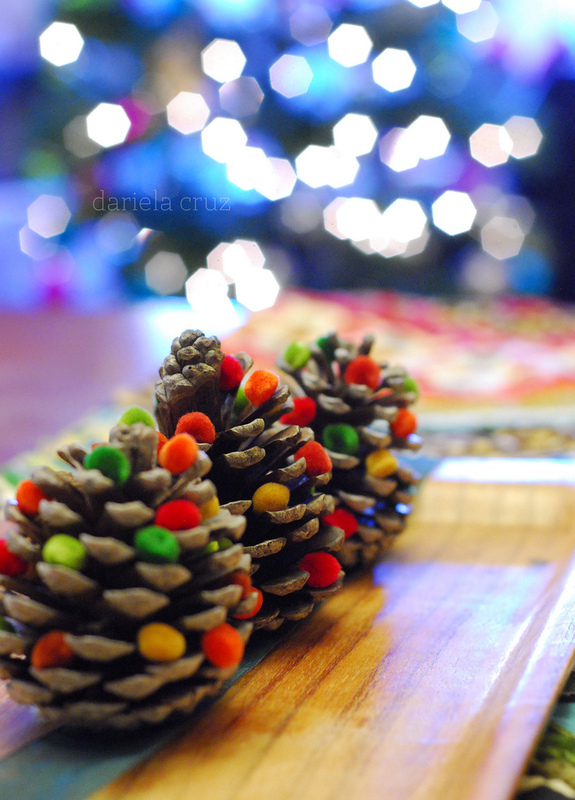 She has two tutorials for creating wax-dipped pine cone ornaments. One of them uses crayons and the other uses beeswax. Both are beautiful and worthy of gift giving.